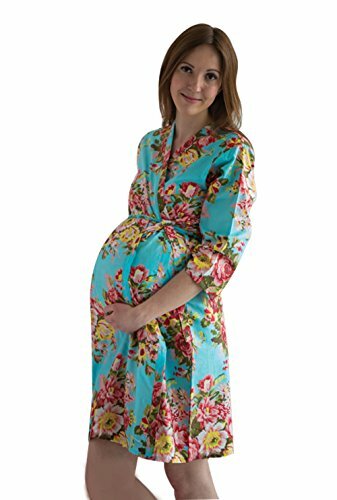 Made from softest cotton fabric, this Maternity Delivery Gown is an ideal pick for our new moms as well as our moms to Be. It has the softest feel to the fabric and the front open pattern gives ease for nursing. It makes for a wonderful Baby Shower gift. It is a crossover style with open front with inner ties and outer belt to keep it secure. It is 39 inches long from shoulder to hem. 6 different floral patterns are available in color Turquoise Blue. Choose the pattern of your choice. This will make a perfect hospital gown to wear during labor and after giving birth to your baby. As it's a crossover robe with open front, it will also be perfect for nursing. It makes for a wonderful Baby Shower gift. It will also be a great addition to your maternity pictures. MyGrowingbelly is silkandmore's maternity brand. Silkandmore has been making robes for moms and to be moms for over 8 years now. If you have any questions about this product by My Growing Belly, contact us by completing and submitting the form below. If you are looking for a specif part number, please include it with your message.